Look at the fear in Joe’s eyes. “I never should have asked him to go,” he laments to himself as he prepares to take a beating. And what a fight it was. 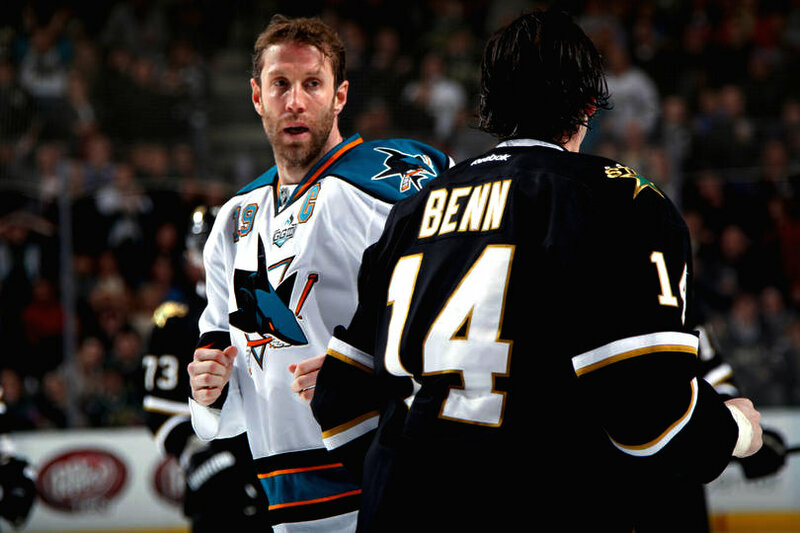 Joe Thornton’s had a penchant for fighting star players lately (see: Jonathan Toews) and he did it again last night. Some called it the greatest fight from a Stars player since Benn fought Jarome Iginla, and it’s hard to argue with that statement. The fight was a turning point in the game, as the Stars scored a bit after it and ended up dominating in a 3-1 win. Jamie Benn got the Gordie Howe hat trick. I think it’s interesting how it’s the second GHHT this year, yet before Dillon’s the Stars hadn’t had one since I think 2007. Alex Goligoski had a hell of a game. Tommy Wingels has a fantastic name, but he’s kind of a coward. He started that one scrum and then wouldn’t even fight a rough and ready Morrow. Really, Wingels? Really? Nilstorp got his first career win, which is awesome. SELLOUT CROWD. And they got to see a hell of a game. Okay but, uhm, here’s the bad thing: we finished the game with four defensemen. It looks like Larsen’s going to be okay (that fall into the boards looked really nasty, though), but I still haven’t heard anything about Aaron Rome’s foot injury. So that’ll be an interesting development. Overall, those were two very important points that the Stars earned. They played so well last night and I can’t get over it. Maybe it’s time we should believe in this team. Maybe. That Three-Game Winning Streak? Not Happening. I waited to post this because I thought the Stars might actually oull the magic winning streak out of a hat. Sadly I was wrong. Oh well. If we somehow miraculously made it to the eighth seed, San Jose would be very afraid. I love this era of owning the Sharks. Sure we’re playing for pride at this point, but it feels nice to win against the Sharks. It’s like a reward for the woes of the rest of the season. And how about Steve Ott? I’m not gonna lie, but when he got his hat trick, I jumped off my couch and did a happy dance. Hat tricks make me happy, especially when they come from one of my favorite guys, Steve Ott. Way to go, Otter. You earned it. It’s funny, but if you were sitting at that end of the AAC, you saw every goal. That was just sort of random and funny, I thought. Anyway, all I can say is that I love Jamie Benn. That kid is a monster. Just…wow. I was glad to see Modano and Lehtinen have such great games. It was very reminiscient of the old days. It was also painfully sad to watch them knowing their careers are almost over. They didn’t play too badly, just not good enough. I thought Lehtonen was fine as was the Benn line. It was Niskanen that really played badly. It was sort of a lifeless game, in my opinion. It had its moments, but it was pretty boring. And how about this? Brad Richards is only one point away from his career high 91 points. He’s also three away from the franchise record of 93, set by Mike Modano. Come on Brad, get some points and break some records! Yeah…this season’s over. But whatever. Let’s go out with dignity, okay, Stars? Be the spoilers just because it’s fun to do that. So…how will tonight’s Stars-Sharks game play out? I’m thinking a 20-round shootout with a game-winner by Toby Petersen. That’s how these Stars-Sharks games have been playing out. I wouldn’t count on a win for the simple fact that this is supposed to be a loss in the win-lose cycle. I’m not expecting them to win tonight. Plus, the Sharks are really good on the road. I’m not too optimistic for tonight’s game. Ivan Vishnevskiy’s been called up because of the injuries to Daley and Fishsticks. He might stay up for awhile this time around. So that’s pretty cool. Tonight, we play the Sharks. 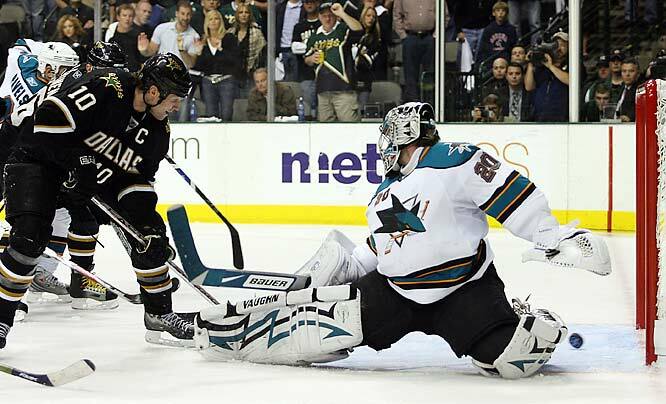 If you recall the last Stars-Sharks game, it ended with Stephane Robidas scoring the game-winner. No, really I’m serious. 😉 But only after the Stars had an epic comeback in the span of two minutes in the third period. Back to the present now. The Stars aren’t doing so hot with two extra-minutes losses in a row and a lack of scoring. I think that winning tonight’s game will be much harder to pull off than last time we beat the Sharks. If they win of course. And hopefully they will. But I’m not counting on it. Duh. It’s probably your favorite, too. But it’s one of the most flipping amazing moments in Stars history. San Jose Shark I’d Most Like to Have on My Team: Patrick Marleau. He might have had the captaincy stripped away, but he’s still a really good player. Sure he’s a playoff choker, but maybe it’s just his team. He’s a little bit soft (remember that Modano shot he “forgot” to block in the 2008 playoffs? ), but he’s still super-talented.